André Ristic, piano, Julie-Anne Derome, violin, and Gabriel Prynn, cello, formed Trio Fibonacci in Canada, and are now resident in Brussels. This Belgium-based group is well known in European contemporary music circles and further afield; they're making an appearance in the BMIC Cutting Edge series at The Warehouse in London, November 3. They are not to be confused with The Fibonacci Sequence , a more eclectic and listener friendly set-up than this hair-shirt group, who make their NMC debut with as tough a programme of music by British composers as you'll be likely to encounter this side of the Channel. The music here is mostly dour, and to compensate for its seriousness the notes and titles are sometimes jokey. Gerald Barry's for In The Asylum is succinct and clearly not intended to be illuminating. It reads, in its entirety: “In The Asylum the composer is writing three pieces: The Rung, The Potent Rug, Wigs of Flanders.” All three are played simultaneously. 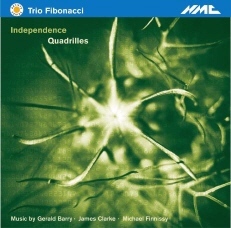 The disc’s title work is by Michael Finnissy. His Quadrilles has each instrument "vertically independent from the others" and the title's 'social dance' connotation is not obvious in the music... In stiller Nacht 'deranges' a Brahms folk-song quite fetchingly. His short portrait of a fellow musician Necessary and More Detailed Thinking leaves plenty of that to us! James Clarke (b.1957, London) is better known on the Continent. His austere Piano Trio is replete with glissandi, sul ponticelli, artificial harmonics and unusual piano effects and short on recognisable 'melody'. Solo works for piano, violin and cello are a little more accessible, and I enjoyed hearing the cello piece Independence Part 1 which used devices exploited by the innovative American cellist Frances-Marie Uitti, who likes to play with two bows together. Trying to crack the 'code' of this obscure composer, I noted that Isolation's five pages are played in a prescribed order: 1-2-3-4-5-2-4-3-5. You'd think that would help, but I was completely stymied trying to follow that sequence aurally for nine minutes; why did NMC not think to supply track times in mins and seconds to make it possible to follow the form from the insert booklet? But, determined to keep trying, I noted a link to Clarke's website where, with two articles by one of my favourite violinists, help must be at hand. But Mieko Kanno's The rhetoric of the shadow: a semiotic study of James Clarke's Isolation proved prolix and recondite, even with music examples (copied below without express permission). As with the music of Ferneyhough, there is not much scope for individual interpretation; Clarke seemingly expects those details to be realised, quarter-tones and all? Having read Kanno's analysis, I remained little the wiser, so decided to explore the score itself, which was kindly supplied promptly by the Promotion Department of BMG (Ricordi UK). Light began to dawn, and it now proved easy to follow the five pages and their re-ordered repetitions despite the specific instruction that there are no breaks between the pages. Admiration grew for the consummate skill which Julie-Anne Derome (and, no doubt, her predecessors who had performed this piece, including Kanno herself and Irvine Arditti) brought to bear on the task. Think of top 'extreme' sportsmen and acrobats; the mental and physical qualities needed are equally phenomenal and likely to escape the casual listener, who can only hear the superficial surface of such music. So I stop there, leaving you to seek Clarke's 'more direct, more communicative form' by following the sea-gulls to the website-trawler. 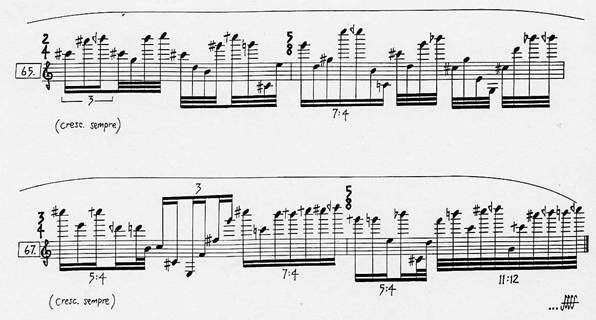 Responses from readers who understand this music and Ferneyhough's (or enjoy collecting CDs of it even if they don't) will be welcomed by Musical Pointers, which carries an open invitation for new contributors on the Index Home Page.